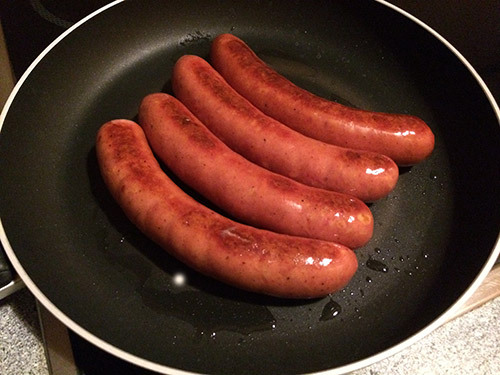 Last night we chose to have something what many Austrians enjoy – The Käsekrainer. 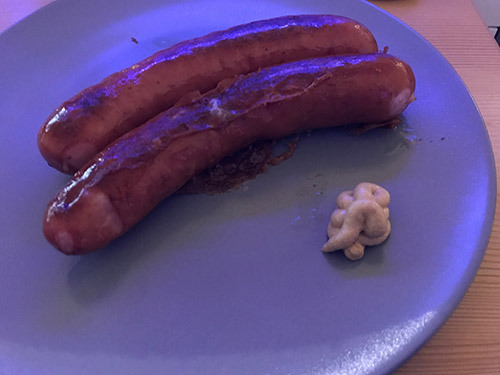 I have tried a few wurst varieties while in Vienna, but so far this one is my favorite. It contains cheese, which really compliments the meat. I bought it at a local supermarket, but I’m guessing it can be found all around. You cook it in a pan, with a little oil, for 15 minutes on one side, or until you start to hear the cheese popping. Then you turn it over on the other side and repeat the procedure. Simple and tasty! 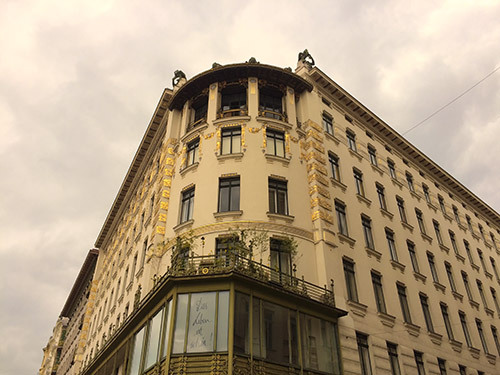 This entry was posted in Allgemein, Die besten Wien-Tipps on 30. September 2017 by Andra Tanase. In the first few days after moving to Vienna, I had a hankering for cooking with fresh fruits and vegetables. Unsatisfied with the selection from the nearby supermarket, I set out to find a nearby market: there had to be something better. And not five minutes from where I live, I found this colorful, chaotic crowd of fruit and vegetable stands, seeds, incents, music, outdoor shops and terraces where people can chat, have fun and enjoy a nice day out. 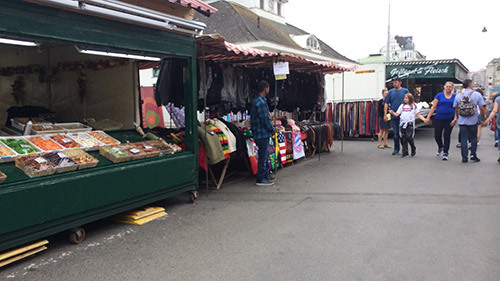 There’s a mixture of smells and aromas, things old and new for sale and dishes from all over the world to try out. I haven’t yet tried something prepared entirely there, but I bought some tomatoes for home, which tasted really delicious and fresh. Whenever I need fruit or vegetables now, the nearby Naschmarkt is my first choice. Have you been there yet? This entry was posted in Allgemein, Die besten Wien-Tipps on 29. September 2017 by Andra Tanase. Last summer I was here for an extended visit and had a bit more time to travel and sightsee. One weekend we drove up to Myra Falls, in Lower Austria. 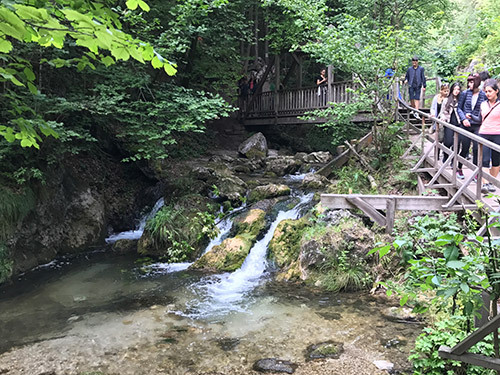 It’s a beautiful system of waterfalls, which extends for 20 something flights of narrow wooden stairs, on which you can walk up to get to the top. There were very many tourists there on that hot summer day, as it was on a Sunday, but the falls gave a very pleasant breeze which made the heat bearable. The water was splashing everywhere around you, very loud and wild, and we photographed everything on our way up, and then down for the descent, because we wanted to take that beauty home with us. When you get to the top, there is a lovely meadow and there you can find a small place where children can play, while the adults relax with some well-deserved refreshments. I really enjoyed that Sunday at Myra Falls and would definitely add it to the ‘must see’ list in Austria! This entry was posted in Allgemein on 28. September 2017 by Andra Tanase. I’ll tell you a little bit about my Deutschkurs and the atmosphere in the group. This is already our third week in class and time is going by so quickly. We’re covering a lot of ground fast, it’s an Intensive course, so we meet four times a week (Monday – Thursday) for three hours a day. Sometimes, because of this, you feel like there’s so much information that you receive every day, and many homework to catch up on over the weekend. But at the same time, there’s an advantage to having the information fresh in your brain, as opposed to, let’s say a course that meets twice a week. Ultimately, I think that everybody chooses what’s best for their learning style, a half-intensive course allows you for more time to ponder the new information and perhaps gives it time to sediment, but it could also mean that you forget many things learned the week before. The people are really friendly and committed to learning, they are from all over the world – Indonesia, Peru, South Korea, Mexico, Spain, Poland, Romania, and so, just like me, they want to improve their level of German so they live better here. Our teacher, Sinen, is gentle and pleasant, and helps us in any way she can. She tries to many the class as welcoming as possible, and that really shows, by including games and entertaining ways for us to engage with each other and practice speaking German. 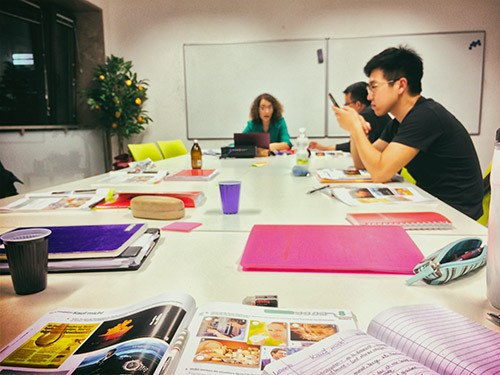 Yesterday I’ve decided to book my next class, which starts in October, because I think I’m benefiting from being part of the DeutschAkademie environment and it’s helping me with adjusting to my life in Vienna. Thanks for reading and following! This entry was posted in Mein Deutschkurs on 27. September 2017 by Andra Tanase. 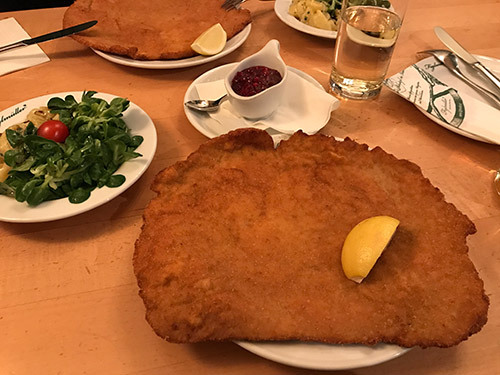 So one can’t move to Vienna without trying their delicious marker – the Schnitzel. 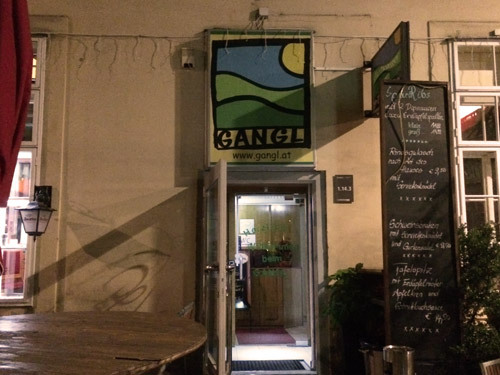 For this, we decided to go to one of the most recommended restaurants – Figlmüller, which you can find in the First District. Many people on tripadvisor were saying that it’s a great culinary experience and the best schnitzel in Vienna, so I had to try for myself. It was really delicious, just enough crunch and rich meat, and was beautifully complimented by the potato salad, cranberry sauce and drinks. Of course, I had to take more than half of it to go, but this just meant that I enjoyed it later as well. My recommendation is – you have to try it for yourself. What other good places for traditional food have you found in Vienna? This entry was posted in Allgemein, Die besten Wien-Tipps on 26. September 2017 by Andra Tanase. This weekend we discovered Haus des Meeres, an Aqua Terra Zoo just up the street from where I live. It’s 9 floors full of various fish, underwater animals and some species of reptiles, birds, monkeys and even bats! It’s really cool if you have the chance to schedule your visit during feeding times – information for which you can find on their website- so you can experience firsthand how sharks, fish and alligators devour their food. Rawr! I really loved the giant turtle that I’ve seen there – it was a first experience for me – and enjoyed the slow but elegant way they move and twirl amongst the water bubbles. The whole place is very well kept and the animals seem good taken care of. 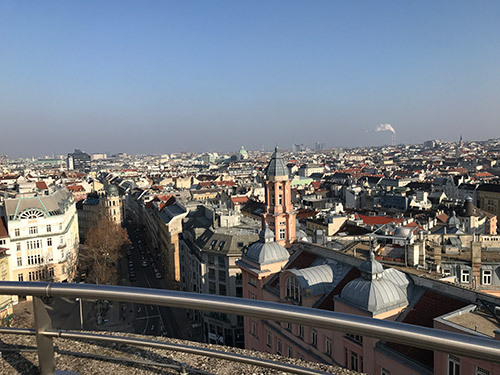 Aside from the beautiful things that you get to see, there is also a cozy rooftop restaurant, with a spectacular view over Vienna. I spent the better part of an hour admiring the near and far buildings of this beautiful city that I have moved to. This entry was posted in Allgemein, Die besten Wien-Tipps on 25. September 2017 by Andra Tanase. 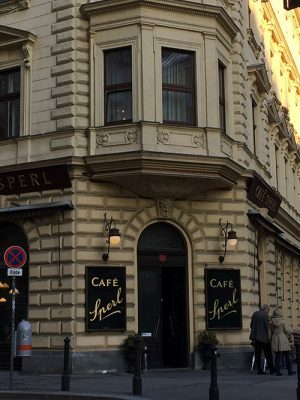 Down the street from where I live, on Gumpendorfer Straße 11, you can find the famous Café Sperl. This traditional establishment is really old, founded in 1880, and you can feel the vintage atmosphere as soon as you set foot in. 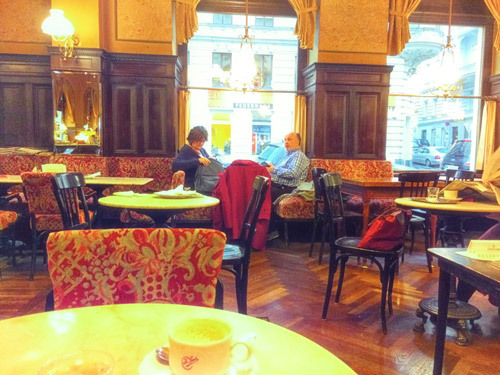 All the original furniture has been preserved, the tapisteries from olden ages, and a visit at Café Sperl is like a dive into the history of Vienna. It is said to be the scenes of many artists and writers over the years, Franz Kafka for instance, and it has also been used for many scenes from movies. Here you can find traditional foods and drinks, including many varieties of local coffees and of course the famous Apfel Strudel. What do you say, would you be curious of such a traditional outing and incursion in the Viennese past? Let me know in the comments below. This entry was posted in Die besten Wien-Tipps, Geschichten on 24. September 2017 by Andra Tanase. It was a day like any other and I was returning from shopping at the Nashmarkt, standing in line and waiting for the street light to turn green. I look up and suddenly see something that makes me smile: a house with intriguing flowery design, unlike any I’ve seen just laying around in a city. Next to it was another beautiful house, this one with amazing golden finishings. I thought to myself “What a pretty city I moved to, where one can just encounter such houses on the street, on a regular day”. 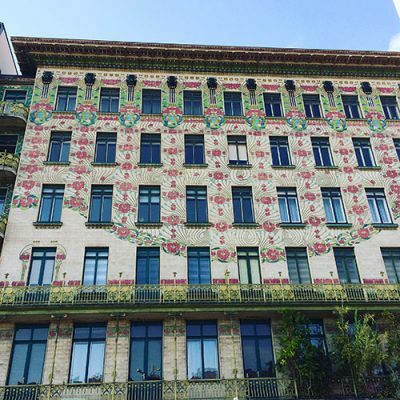 I did a bit of research and it seems the flowery house is also called the Majolikahaus and they were both designed by Otto Wagner, an Austrian architect and urban planner who lived here in Vienna and contributed to many beautiful landmarks. Looking forward to seeing more! This entry was posted in Die besten Wien-Tipps on 23. September 2017 by Andra Tanase. Jolly night, greeting the weekend! Yesterday evening we went to Stammtisch, the monthly get-together event for the Deutsch Akademie, and my very first! We went together after the last German class of the week and was a very fun and memorable night. I got to know the other students in my class better, have nice chats with them and the teacher over a good drink at Gangl. There were some contests as I could understand, where you could win books from the Deutsch Akademie, but that was already over by the time we got there from class. Nonetheless, the night was very much enjoyable and I got to learn about everybody’s cultural background, why they decided to move to Wien and even got a few nice tips over new places to visit. I really recommend this type of event, the mood was light and the people friendly, and it is also a good chance to put your spoken language skills into practice. The most interesting aspect of the evening, however, was something that I hadn’t anticipated. Up until now, when I was in social situations and German was spoken, I had a hard time understanding and was very easily getting lost. This time, I was surprised by how much I could understand and express in return, towards staff, students and even native speakers. It was as if I had been under water for a long time and now all of a sudden, everything was starting to make sense. It’s made me very eager to continue my studies and see even better results! I must apologize for not documenting the evening better photographically, but we were really having such a nice time that it completely slipped my mind. I promise to make up for this in the future. This entry was posted in GET TOGETHER-STAMMTISCH on 22. September 2017 by Andra Tanase. One of the most magical afternoons of this summer, while the weather still allowed it, was the visit to Schönbrunn Palace gardens. Since its opening in 1779, it has attracted and amazed tourists from all over the world. There is a unique beauty in the stillness of the grass statues which blends perfectly with the neatly cared for flower walkways. The Botanic Garden is a thing of beauty and all the gardens were artistically designed by landscapists employed by the royal family, at one time or another. 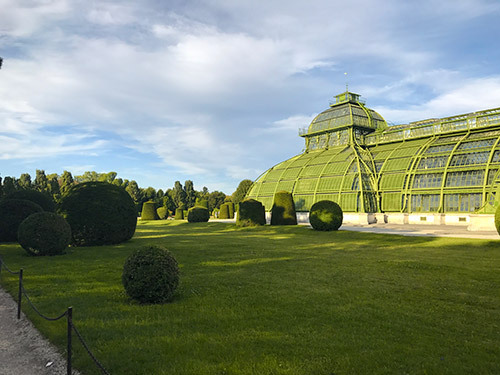 Over time, the park was extended and articulated by a maze of avenues, which intersects with walks and vistas, and is meant to be an external continuation of the beauty inside Schönbrunn Palace. When spring comes and weather allows it again, I will definitely go back and explore some more, or maybe just spend hours on a lazy afternoon laying on a blanket, admiring the sites. This entry was posted in Allgemein, Die besten Wien-Tipps on 21. September 2017 by Andra Tanase. New challenge – moving to Vienna! Meet Andra, a decisive and energetic marketing professional, with an eye for fine-touch details and a bundle of creativity. Since she was a girl, she discovered she enjoys playing with words and tinkering with turns of phrase, into such a way that intrigues the reader and feeds his hunger for further knowledge. What does she do when she’s not at her desk, hamstering at the keyboard? Well, as any good writer will tell you, in order to be a writer, one must first be a reader. She enjoys literature, losing herself in the shoes of a fictional character for a few good hours on a quiet afternoon. She has developed a passion for painting as well, and very much enjoys how the rest of the world goes quiet when she’s holding a brush. The fictional characters, world of games and lots of daydreaming so frequently slip into the themes of her paintings. 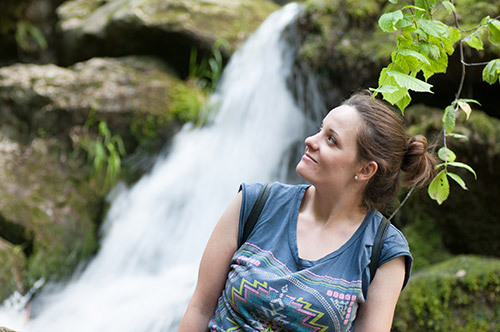 A forever adventurer, this autumn she took a new challenge: moving to Vienna. Taking on a new city and exposing herself to a new culture will hopefully take her career at the next level as well as help her grow on a personal level. Stay tuned to find out more! This entry was posted in Allgemein, Geschichten, Mein Deutschkurs on 20. September 2017 by Andra Tanase.